Times Square, New York City's nexus of TGI Fridays, Sbarros, Arby's, Five Guys, Burger Kings, and one ill-fated Guy Fieri restaurant, never stops reinventing itself. Once a place where degenerates gathered to break the law, Times Square now offers a similar environment for a different kind of scourge: bees. 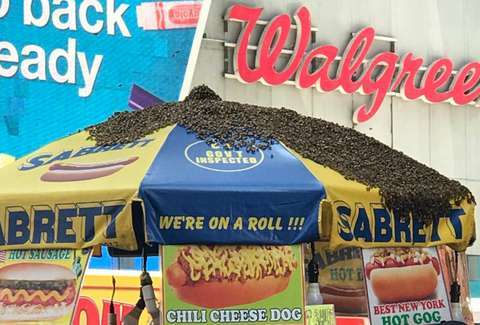 On Tuesday, a swarm of bees descended upon a hot dog cart in the middle of Times Square. They coated the Sabrett umbrella in a bee-blanket, drawing attention from every fanny-pack wearing tourist and sweaty policeman. In fact, the NYPD had to summon its official beekeeper (what well-funded police department doesn't have a beekeeper?) to control the unruly swarm. Because bees don't usually flock en masse to the nearest processed meat vendor, NYC media pounced. A scrum of journalists hit the scene, and a bunch of livestreams were broadcast on social media. The scene was a biblical plague, with -- one can only assume -- the smell of hot dog wafting through the late-summer humidity. Because New York is home to many media-types who spend too much time on Twitter (self-included, baby! ), the bees prompted jokes. Biggest takeaway thus far from Times Square BEE SWARM is NYPD officers have embarrassingly bad bee dad jokes. The heat index is over 104. Bees are taking over Times Square. Received community email about low-flying helicopters dropping rabies vaccines on the local raccoon population. Are we sure we’re not already in the post-apocalyptic landscape? The NYPD's dutiful beekeeper used a vacuum to remove the bees, and authorities say none we harmed in the process. According to a report in the Washington Post, bees typically swarm around late spring after the Queen bee departs from the hive, bringing a bunch of her hive with her. It does happen later in the summer, however, and now it's certain that no venue is safe from a potential bee-invasion, including hot dog stands in the most iconic tourist trap on Earth.